I'm a sucker for durable space opera novels. 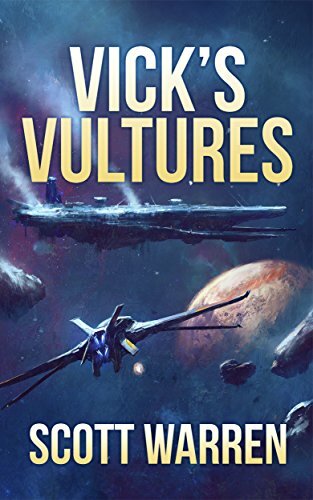 I like crews on space ships flying around doing things in the vastness of space, and one of the books that I came across earlier this fall was Scott Warren's new novel Vick's Vultures. The premise of the novel is pretty straightforward: humanity has entered a larger diaspora of galactic civilizations, and has been keeping its head down, for the most part. We realize we're outgunned, and have been salvaging tech from other aliens to catch up. Vick's crew on board the U.E. Condor have been doing just that, and rescue First Prince Tavram, heir to a massive empire. Another empire is after him, and they flee through space to get him home. It's a straightforward tale, and a nice diversion from some of the headier genre books out there. (The audio edition is also quite good). It's fast and engaging, and it's the type of book that falls neatly in line with the likes of John Scalzi or Marko Kloos. It's not straight-up military science fiction, but there's plenty of action and combat to keep you entertained.